Reporters from RT (Russia Today) traveled to Gaza to look into last year’s report that 90% of Gaza’s water is undrinkable. As they sampled water from different parts of the coastal Strip, they found that the report is accurate – the water throughout Gaza is dirty, salty and undrinkable. “We can’t drink it, cook with it, or wash in the kitchen with it… we are forced to buy all the clean water separately,” said Umm Ibrahim Amna Abdel’al, one of the people interviewed by RT. Abdel’al told the reporters that “tiny kids suffer from cramps and colic” because of drinking the water. She showed them a skin infection on her hand which she says is because of the filthy water as well. Tests of the water found that it has a high level of salt, rendering it undrinkable. But the water entering homes in Gaza through faucets and taps is also full of nitrate – a carcinogenic. The levels rose even higher last year, during Israel’s bombardment of sewage pipes and clean water pipes. Now, the two chemicals have mixed. And since the 2014 onslaught, Israel has prevented the import of materials that could repair the damage – thus further exacerbating the already dire humanitarian crisis. Prior to Israel’s invasion of Gaza in July 2014, the Israeli Information Center for Human Rights in the Occupied Palestinian Territories B’Tselem issued a report that 90% of the water in Gaza was unfit for drinking. According to RT, the Gaza Strip’s GDP dropped 15 percent in 2014, with 72 percent of households suffering extremely low food security and unemployment at a record high of 44 percent. Further stress was added by relentless Israeli assaults. With three military operations in the last six years, coupled with eight years of economic blockade, prospects for recovery are looking very bleak. 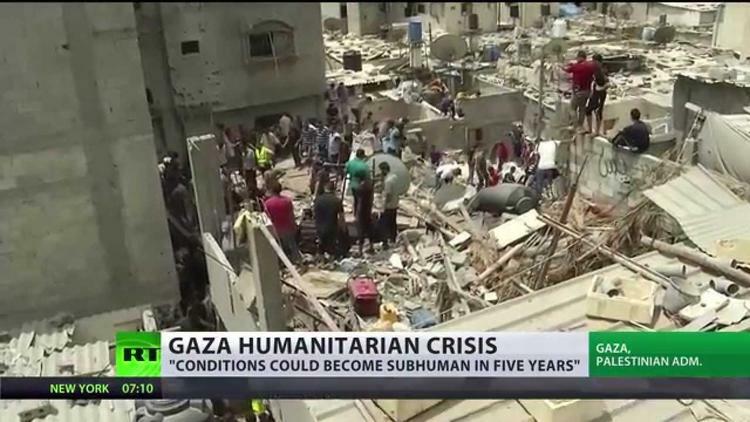 The UN says that 500,000 people have been displaced in Gaza as a result of last year’s IDF operation alone. More than 20,000 Palestinian homes were destroyed, and 148 schools and 15 hospitals and 45 primary health-care centers were severely damaged. Gaza is one of the most densely populated areas in the world. But the condition of the water is the worst part of the infrastructure destruction, as it leaves the population of Gaza largely without potable water. According to the RT Report, unless the situation is resolved, the Strip stands on the brink of a full-scale humanitarian catastrophe much greater than any airstrikes can cause.